GOING ON ADVENTURES: Would you book a cruise on a Carnival ship? We took a chance and were pleasantly surprised. Since the engine room fire totally disabled the Triumph and left the ship adrift in the Caribbean for eight days last February, Carnival ships have been plagued with an assortment of troubles. Within a three month period several Carnival ships reported problems severe enough to interfere with their scheduled journeys. 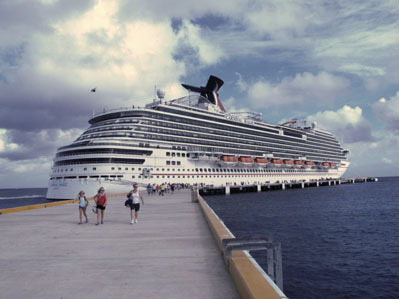 The Elation suffered a steering system malfunction, and Carnival Dream lost power causing some toilets to stop working. Then the Legend had technical difficulties that affected sailing speed. Not a fun time for guests looking forward to a special vacation. With all these ominous signs, I was very hesitant to cruise on any Carnival ship. But we had promised to take two grandchildren on a cruise this summer, and I’m happy to report that the Carnival Magic, sailing from Galveston, Texas, turned out to be a fine venue for sailing with children. Attracting families is what Carnival does well. 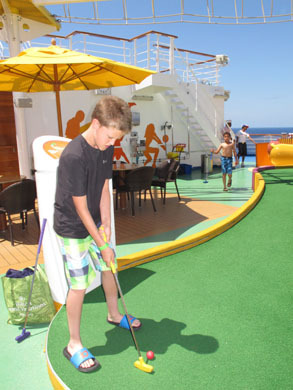 Activities and amenities aboard the Magic are set up to keep all ages happy. Clubs for children and teens are grouped by age to provide special events and activities throughout the day—even parties lasting till 3:00 a.m. From age 12 on, kids can sign themselves in and out, which makes the program especially flexible. Decor is bright and colorful (sometimes a bit gaudy), but it works for this ship. Several swimming pools and hot tubs are scattered around the ship, including one for adults only. 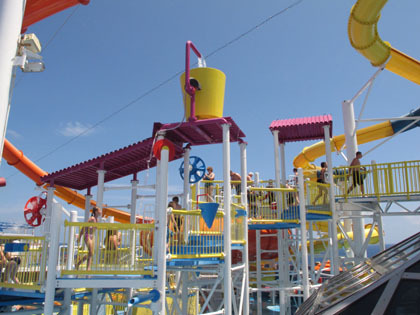 There’s a large onboard water park filled with multiple squirty ways to get wet and stay cool, including a giant bucket that fills with water and dumps every so often. Two giant slides whirl guests who are at least 48 inches tall through twisty tubes and spinning saucers. Small fry have their own right-sized water slides. 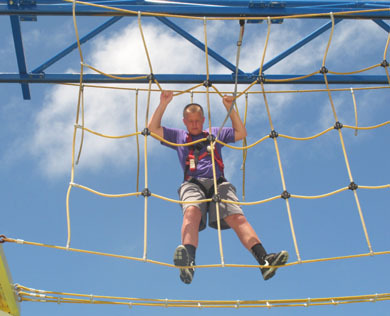 A ropes course challenges balance and agility (only open when winds are calm). Mini-golf, pool tables, ping-pong. Foosball, a basketball court, and modified outdoor gym area give young muscles a workout and burn excess energy. An indoor gym and full service spa keep adults fit and relaxed. But don’t let the kids have all the fun—go ahead and try the slides and ropes. Take a dance class or participate in trivia and other games. If you’re really a sport, join the hairy chest contest. 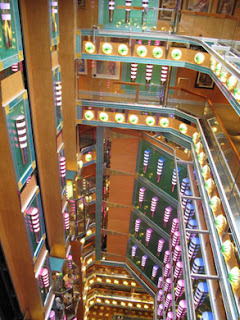 Dress is more casual on Carnival ships than on other lines whose clientele is more mature. Our grandsons wore nice shorts and collared knit shirts to the dining room each evening, changing to long khakis for the two “elegant” nights. Although some people still cling to the “formal” designation, dressing up simply isn’t necessary. Sure, you can just graze at the buffet or nosh on pizza and hamburgers, but dinner time was a good opportunity for the boys to put manners they already knew into practice in a more civilized setting. And they had plenty of pizza and ice cream during the day. There’s such variety of shore excursions that adults traveling with or without children can find something that fits their interests and abilities. Getting out and exploring the destinations (the Magic docked at Roatan, Belize, and Cozumel) is one of the best parts about a cruise. It’s a great time to try activities you ordinarily wouldn’t do like snorkeling, ziplining, or kayaking. In fact, our grandkids were ready for a rest after returning to the ship each port day. The ropes course is a recent addition to newer Carnival ships. So I’m giving the Carnival Magic thumbs up for family travel. If you’re on a budget, check current prices as previous problems and publicity that followed have lowered costs of certain sailings. This may be a good year to book a cruise vacation.